Last Saturday night CBS 48 Hours Mystery (one of my favorite shows) presented a fascinating case if you’re a fan of story structure. A prosecutor tried once and failed. Then on his second try, he basically shrank the river of story and won. THE TRUTH SWIMS AGAINST STORY. (Figure 15 from “Houston, We Have A Narrative”). 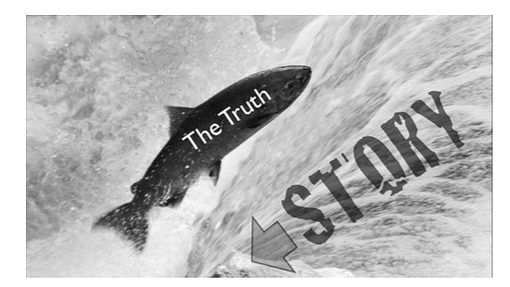 The fish of truth has a hard time when forced to swim upstream against the river of story, BUT … what if you shrink the river of story? The murder case itself was pretty weird. A woman shot her husband of 15 years in the head twice, then claimed it was an accident, caused by their imitating a Bugs Bunny episode. The story she spun in the initial trial was so unusual, specific and almost plausible that it ended up overriding the huge body of forensic evidence presented. The proscuting attourney, similar to so many prosecutors who present mountains of science-based evidence, was fairly stunned when the jury voted to acquit — as stunned as an evolutionist with all the science-based evidence who loses a debate to a creationist telling great stories. Some of the jurors bought her story. She claimed that she and her wacky husband routinely quoted Bugs Bunny scenes to each other. In this case she picked up his handgun, he said, “no buwwets,” quoting Elmer Fudd, then she started “fan firing” the gun (similar to old western gunslingers holding down the trigger while “fanning” the hammer for multiple rapid shots). He leaned forward into the line of fire and oof, took two in the head, lights out. Years later the woman was retried for the murder. This time around the prosecutor made a savvy decision. He opted to not present any of her post-arrest interrogation where she told about the Elmer Fudd thing in detail. Because of this, the whole wacky buwwets element never came up. The defense kept expecting him to get into it. He never did. As a result, all the jury got was the science-based forensics information. Unlike the first trial where the jury ended up deadlocked after several days, in the second trial the jury took only one day to reach a decision — guilty. The prosecutor attributed it entirely to the removal of the Bugs Bunny element. Bottom line, in the language of story — if you shrink the river of story (if it goes against the truth), the truth stands a better chance.